Surfactants or surface active agents are organic compounds that are manufactured using petrochemical raw materials such as ethylene and benzene or oleo-chemical raw materials such as coconut oil or palm oil. Surfactants are primarily used for their properties such as emulsification, dispersion, solvency, foaming/de-foaming and lubricity of water-based compositions. Owing to these reasons, surfactants are being used in a wide range of personal care products, paints and coatings, and emulsion polymerization. The research report states that the Asia Pacific surfactants market was valued at US$4.1 bn in 2015 and is expected to be worth US$6.3 bn by the end of 2024. Between the forecast years of 2016 and 2024, the overall market is expected to surge at a CAGR of 5.0%. The Asia Pacific surfactants market is expected to benefit from the flourishing personal care industry and the increasing demand for emulsion polymerization. The growing concerns pertaining to beauty, hygiene, and aesthetics have led to a skyrocketing demand for surfactants in the personal care industry in Asia Pacific. The regional market is also being fueled due to improving per capita incomes of consumers, changing lifestyles, and rise in the standard of living. Furthermore, the upstream integration with raw material suppliers and the expanding geographical reach is also expected to offer lucrative opportunities to manufacturers of emulsion polymers. On the basis of product type, the Asia Pacific surfactant market is segmented into cationic, anionic, non ionic, and amphoteric product types. 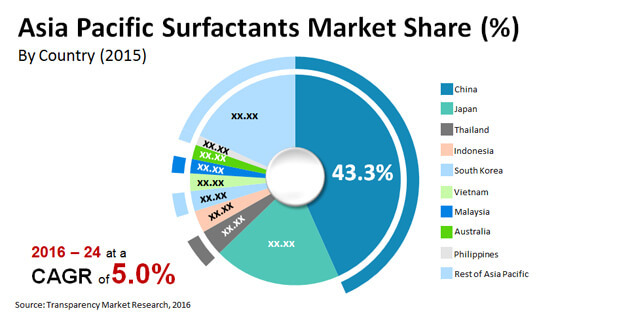 The non ionic surfactants held a dominant share in the overall market in 2015 in terms of volume. This segment accounted for nearly 30% of the overall market in 2015 due to their increasing adoption in the production of agrochemicals, paints and coatings, and concrete. During the forecast period, cationic and amphoteric surfactants are also expected to show steady growth as they have a higher purity and are thus expensive than their counterparts. The Asia Pacific surfactants market is segmented in countries such as China, India, Japan, Thailand, South Korea, Indonesia, Malaysia, Vietnam, Philippines, South Korea, and Australia. Of these, China is expected to dominate the Asia Pacific surfactants market. As of 2015, China accounted for a share of about 45% in the overall market in terms of volume. The phenomenal demand for and production of paints and coatings has put China in the lead. Japan followed this lead closely as it has been assessed to be the leading market for personal care products across the globe. The improving per capita incomes in Asia Pacific, emerging economies, and rising chemicals industry is expected to boost the demand for surfactants in these countries throughout the forecast period. Key players operating in the global surfactants market ADM, Akzo Nobel N. V., Galaxy Surfactants, Dow Chemical, BASF S.E, Huntsman Corporation, Lonza Group, Evonik Industries, P & G Chemicals, Clariant International Ltd., and Stepan Company. The competition in the Asia Pacific surfactants market is quite fragmented. Companies are expected to focus on expanding their facilities and working on product innovation to ensure that they stay ahead of the competition. Most of these players are also expected to focus on development of bio-based surfactants as consumers are realizing the adverse effects of using chemical ones. Surfactants or surface active agents are organic compounds produced from petrochemical raw materials such as ethylene and benzene or oleo-chemical raw materials such as palm oil or coconut oil. It is commercially available as cationic, anionic, amphoteric, non ionic and other (silicone, etc.) surfactants. In terms of application, personal care and paints & coatings held majority share in the Asia Pacific surfactants market. Rising demand from these industries is projected to boost surfactants market during the forecast period. This study analyzes, estimates, and forecasts the Asia Pacific surfactants market in terms of volume (Tons) and revenue (US$ Mn) from 2015 to 2024. The report also analyzes several driving and restraining factors and their impact on the market during the forecast period. The report provides a detailed view of the surfactants market based on applications. Key applications included in the report are personal care, oilfield chemicals, paints & coatings, emulsion polymerization, agrochemicals and concrete additives. In terms of product types, the market is segmented into: cationic, anionic, non ionic, amphoteric and others (silicone surfactants, etc.). Furthermore, the report segments the market based on key geographies such as China, Japan, Indonesia, Malaysia, Thailand, Vietnam, Philippines, South Korea, and Australia. It also provides market volume and revenue for each application and product under every country level segment. Based on applications, product and countries, the report analyzes the attractiveness of each segment with the help of an attractiveness tool. The study includes value chain analysis, which provides a better understanding of key players in the supply chain (from raw material manufacturers to end-users). Additionally, the study analyzes market competition and industry players using Porter’s five forces analysis. Secondary research sources that are typically referred to include company websites, annual reports, financial reports, broker reports, investor presentations, and SEC filings, internal and external proprietary databases, and relevant patent and regulatory databases. Other sources include national government documents, statistical databases, and market reports, news articles, and press releases and webcasts specific to the companies operating in the market. Secondary sources referred for the study of the surfactants market include InfoMine, U.S. Geological Survey, Internet Archive Educational Portal, and company presentations. Key players profiled in the surfactants study include ADM, Akzo Nobel N. V., Galaxy Surfactants, Dow Chemical, BASF S.E, Huntsman Corporation, Lonza Group, Evonik Industries, P & G Chemicals, Clariant International Ltd. and Stepan Company.